Principal Financial Group has resumed its inorganic growth strategy with the acquisition of Wells Fargo’s retirement business. The deal is expected to be accretive to earnings by 2020 and produce a $100 million boost to earnings by 2022. The move will give Principal Financial scale by instantly doubling the size of its retirement business. The buyout is expected to improve PFG’s pre-tax margins at a time when the industry is challenged by intensifying margin pressures. Principal Financial Group’s valuation and shareholder-friendly stance are appealing. PFG plans to finance the deal through a combination of debt ($0.4-$0.5 billion) and cash. Management has estimated that the buyout will result in net revenues of $425 million and create a $100 million bump in earnings by 2022. It also expects pre-tax margins to expand from 22-23% to 28-32% once the retirement business becomes fully integrated due to scale and cost synergies. The transaction remains subject to regulatory approval and is expected to close in the third quarter. On balance, we like the WF deal and think it was probably a necessary one for PFG in the face of industry pressure on fees and outflows. The added scale boosts net revenues for PFG's retirement and income solutions division, which should help the company weather the storm amidst a turbulent backdrop while providing a foothold in the medium and large size markets. Coupled with the sizeable synergies, we think the deal is a net positive for PFG and at ~8x forward earnings, we believe the stock is set to outperform. Principal Financial Group's core strategy centers around fee-based sources of revenue and managing its interest rate exposure to boost its financial performance. Amidst a challenging industry backdrop, it has been able to achieve growth inorganically by making acquisitions that augment its fee-based business and expand its global footprint. The company's impressive $1 billion-plus capital deployment plan for 2019 and 40% dividend payout target also make it an appealing investment for the income-oriented value investor. A focus on deleveraging the company's balance sheet is also an attractive investment quality. PFG has used a significant chunk of its earnings to dial up inorganic growth and will likely not end with the Wells acquisition. Last year the company acquired RobustWealth to improve its digital advisory offerings and Internos to boost its real estate investment capabilities in Europe. It also bought MetLife's Afore business to expand its operations in Mexico and accelerate growth in its mandatory pension business. We think the latest purchase of the Wells Fargo retirement unit represents another astute, strategic addition of a fee-based business that strengthens the company's global foot. Wells Fargo's Institutional Retirement & Trust unit includes the defined contribution (DC), defined benefit (DB), non-qualified, employee stock ownership program (ESOP), institutional trust/custody, and institutional asset advisory businesses. It boasts a large number of assets under administration (AUA) of $827 billion) primarily in the mid-case market with approximately 70% of retirement assets in the $10 million to $1 billion range. The Wells Fargo unit does not have a small (less than $10 million) segment of the DC business and does have a good portion of assets in the large (greater than $1 billion) segment. This blends well with Principal's lack of large segment exposure. Furthermore, the Wells Fargo business gives PFG scale by instantly doubling the size of its domestic retirement business in terms of both participants and assets. 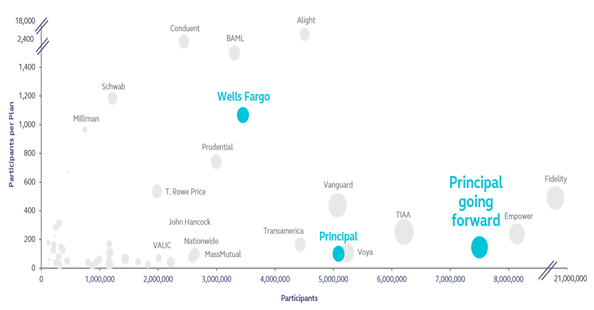 On a pro forma basis, the combined entity is estimated to be the #3 defined contribution business in terms of participants (behind Fidelity and Empower) and #7 in terms of assets. PFG will also be assuming 2,500 Wells employees. If management can execute on the integration of the businesses, the combination should turn into a powerful player in most retirement markets and effectively reduce the company's cost per participant. In addition to the strategic and financial considerations that drove the decision, Principal Financial may have had industry trends in mind when seeking this agreement. The U.S. retirement industry is presently challenged by pricing & fee pressures amidst a shift to net outflows prompted by an aging baby boomer-driven population. As a result, part of Principal's strategy is likely to play defense here. The company recognizes that scale is becomingly increasingly important in the retirement space. Since the Wells acquisition stands to offer scale and steadily increase margins over time, this move may serve to offset the persistent margin pressures faced by Principal and its industry peers. On balance, we think Principal Financial Group's takeover of the Wells Fargo retirement business is the latest example of a well thought out step towards enhancing its fee-based revenue opportunities and expanding its global presence in several markets. The deal is guided to be modestly accretive to earnings by 2020 and provides a substantial boost in net revenue margin to 30% at the midpoint as a result of cost savings. We think this is feasible - it is no coincidence that this comes at a time when the company and its competitors face significant margin pressures. Of course, the deal does not come without risks. Management must prove it can navigate client retention challenges and successfully integrate various technologies but given PFG's track record, we are optimistic on this front. Plus, at 9.0x forward earnings, we think the market is discounting near-term industry challenges as the stock currently sits significantly below its long-term average, offering an opportunity for longer-term investors to buy a beaten-down industry leader on the cheap.